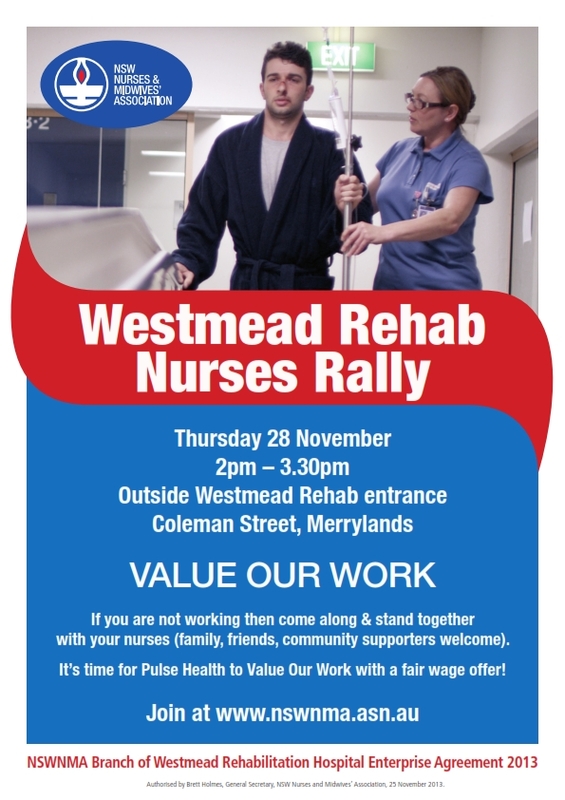 Nurses from Westmead Rehabilitation Hospital will rally this Thursday 28 November from 2-3.30pm outside the hospital entrance in Coleman Street, Merrylands. Family, friends and community supporters are welcome. Pulse Health owns Westmead Rehab as well as two other private hospitals in NSW. Pulse’s current offer for a new Enterprise Bargaining Agreement leaves the Westmead Rehabilitation nurses behind the other Pulse facilities and behind other private hospitals in the area. At the beginning of October, Pulse made an improved wages offer as part of the current round of negotiations for the enterprise agreement. A meeting of NSWNMA members discussed the improved pay offer on 15 October and members concluded that this offer was still not high enough. The NSWNMA took this feedback to Pulse’s representatives and requested a further improvement in the offer. Pulse representatives declined to improve the offer any further. At a meeting on November 22, the branch resolved to take industrial action in support of their claim.